Unfortunately, due to thuderstorm and lightning forecasts starting tonight and going through tomorrow, the work day at Wyalusing State Park for Saturday, April 25, has been cancelled. Because the rain is scheduled to continue throughout the weekend and the busy camping season starts in a few days, we will not be able to reschedule this event. We hope that you will check out other events that the Friends of Wyalusing State Park (http://www.wyalusing.org/) have scheduled for the summer, however, and continue to get involved in your local park. We greatly appreciate your enthusiasm for helping out our local park and I hope that we will see you enjoying the Wisconsin State Park System this summer! We all do what we can when it comes to Spring cleaning! Me, I straighten up the mess that Winter left behind in the online scrapbooks! Yeah, I know, it's not dusting, or raking the lawn, or de-thatching the lawn, or fertilizing the lawn, or weeding the lawn, or spading the garden, or tilling the garden, or transplanting the bush, or painting the shed, or.... These things are on the honey do list. I suspect, they will also be on the list a month from now, when it will be too late! Hope Springs eternal! But, I did straighten the online Wyalusing Photo Albums! That counts a little doesn't it? The albums are all categorized according to subject. 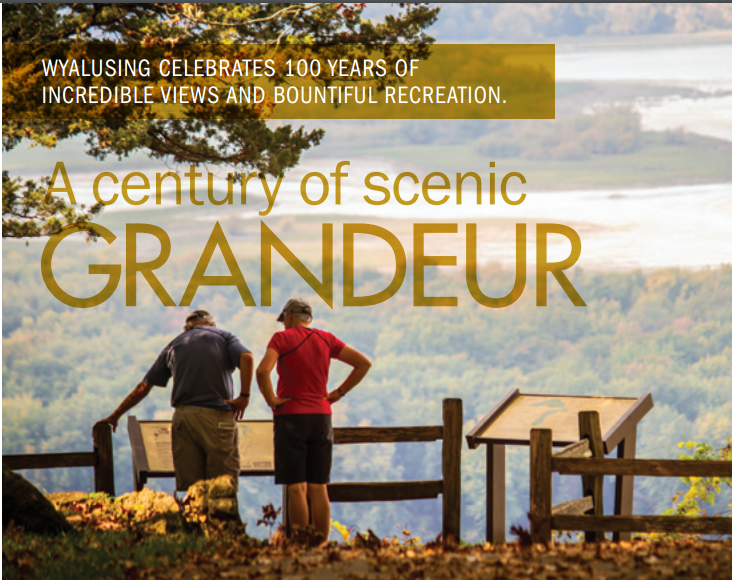 All the better to find your favorite Wyalusing scene. There are tons of Pt. Lookout photos. I'll bet everyone has lots of those, huh? See Photo Albums here. There are great new photos of Sand Cave in April. Not many of you may know tha t there is still ice on the floor of the cave. 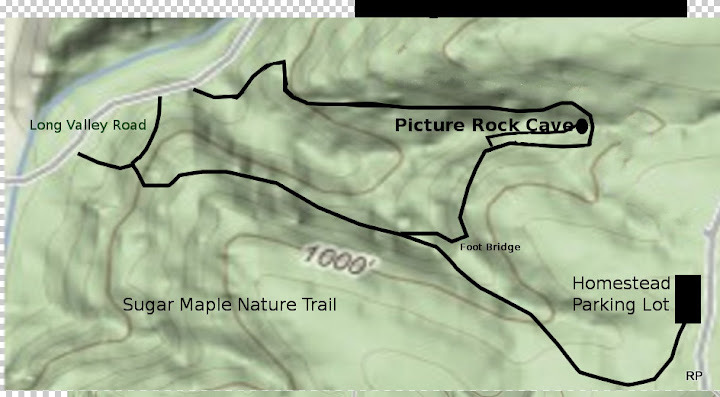 If budget allows, there may be a new trail going to Sand Cave. The new trail will follow the contour of the hill side. There will be fewer wooden steps to climb. The new trail will make access a little easier. The trail will be designed for easier maintenance and access for emergency vehicles. Be sure to watch this blog for progress photos. As of this writing, the prescribed burn for parts of Wyalusing State Park is on hold. The park staff is waiting for cooler, wetter weather. Although this sounds counter-intuitive, the burn is supposed to be controlled. Why is fire used deliberately on native habitats? Fires, whether caused by lightning or Native Americans, have been common on the Wisconsin landscape for thousands of years. Settlement, roads, and fire control have reduced the occurrence of wildfire. Fires prevent brush and trees from invading prairies, keeping woodlands open and free of brush, remove accumulated dead vegetation that retards new growth, release nutrients that enrich the soil, and improve habitat for many wildlife species. How is the burning done? Very carefully! Burning is done according to carefully prepared plans, controlled by volunteer crews, supervised by trained fire specialists, and conducted only during selected weather conditions. A crew member stays with the fire until certain that it is safe to leave. Burning is done in both the spring and the fall when dry conditions allow the vegetation to burn well. Summer burning is sometimes used to handle specific weed or shrub problems. Does fire destroy nests and bird eggs? There are cases when management objectives require us to burn after nesting season has begun. This is not as hard on ground nesting birds as may be imagined. Most of these birds will re-nest and produce a brood if the original nest is destroyed. The second nests are often more successful than early nests because there are more insects available for food later in the season. Insects such as grasshoppers are turned bright red by the heat of the fire, making them conspicuous and available to birds immediately after the burn. Most importantly, fire is the best known method for maintaining native vegetation, and this habitat is what many wildlife species need in order to survive in the long run. Are wild animals burned in the fires? Numerous studies show that nearly all wild mammals and birds escape from wild land fires. Small mammals go underground while larger mammals move away, ahead of the fire or jump unharmed across the fire line. Wyalusing State Park usually burns only a small portion of a of land each year, thereby leaving food and shelter for the animals immediately after the burn. Pest organisms such as ticks are decreased by burning. Can mowing be used instead of fire? Regular mowing tends to reduce diversity, deplete the soil of nutrients, and compact the earth. Fire is the most natural method of maintaining natural habitats. Have the goals of fire management been achieved? Saturday, April 25, volunteers will help out at WYalusing State Park as well as other parks across wisconsin. A picnic lunch will be served by the Friends of Wyalusing at the Peterson Shelter around noon. More details can be found here. Each work day will be from 9:30am-3:30pm. Come dressed to get dirty! Advanced registration is free, but required. All volunteers will receive a Work Play Earth Day aluminum water bottle!